Bluffing actually returns to YGO! Oh, of course, we had bluffing in the last format, but it didn't really DO anything. You could set 3 M/Ts and the opponent would still attack with 3 monsters, knowing at worst that you have a combination of 3 Saks/Wides down. Now, a careless opponent could lose all 3 of those monsters to ONE card. The best thing about Mirror Force coming back, in my opinion, is that an opponent setting one M/T and ending turn late-game can actually force a player to shift a couple of their monsters to Defense Position before attacking. They don't HAVE to actually have MF down, just lead the other player to believe they do. Bluffing can actually win a game now, unlike over the last six months, where the opponent attacks blindly. So entirely lucksack-like monster removal is taken out in exchange for skilled removal. Now we have more options in what to do in response to the mass removal; players who don't want to run into MF and are scared of the multi-Bottomless we'll see in response to Dark World will run Jinzo, and possibly Pitch-Black Warwolf. Hey, if the opponent already used Torrential, it's safe to bring out Pitch-Black and it'll protect you from Mirror Force as well. In addition, a Dark World player who runs into Mirror Force can pull some pretty cool tricks after the fact, like Gateway to Dark World'ing a Brron, which summons a Goldd or something. Note: Hopefully you all got a bunch before the price shot up. As of the day I'm writing this, DB2s are hitting around $32, MRD's are hitting around $40-45, and 1/e MRDs are htiting $50+. 5/5 all formats. If you have this card and don't play it, you're the scrubbiest scrub to ever scrub out at YGO. Seriously. Dark Paladin Today we're going to be looking at one of my three favorite trap cards, Mirror Force (the others being Magic Cylinder and Solemn Judgment) for those who care. This review is going to be ridiculously simple. Mirror Force continues its Banned List rotation. Since the first one we got after Ancient Sanctuary, it goes on, and comes off 6 months later. Then on for the next, and this time off. Anyway, definately use the one you're allowed. It's a trap staple except in a few weird decks. I'm not going to tell you anything new you don't know about Mirror Foce. Art: 4.65/5 (I just average the two scores, but I do love it. I'm currently attempting to find a bookmakers that will take the bet that this will be banned in six months. Ah, Mirror Force. One of the great balancing cards in my opinion. With this in a format, massive attacks are less likely and Aggro is held back a little bit relative to Control (Cyber Dragon pushes things the other way). With this, Reapers are more likely to stay in DEF while other, less broken, monsters risk their lives at the hand of opposing set cards. Now, it is generally used as a more shiny Sakuretsu, but it could still be a 5-4-1 against someone very stupid. Why do they make us review these? It just a waste of time. Mirror force is our new main remover with Dark hole so recently out of the picture. Arguably the best trap in the game, but also unchain able and there in lies its weakness. This is Yugioh. Satisfaction Mirror Force is the card we look at today. Mirror Force has always been somewhat called a "staple". But I will tell you why the only reason it sees play. There are a different degree of how powerful a trap is, such as chainable and nonchainable traps. Mirror Force can't chain to anything which gives it a huge disadvantage against many played cards. Mobius the Frost Monarch proves to be a great counter to this card. As Mirror Force won't be chainable to some cards like Mobius, it provides a defense that can create overwhelming card advantage. This format right now has been considered aggressive, and Mirror Force is the answer to it. Mirror Force will protect you against overplayed fields and let you have time to build a control based game. Mirror Force isn't perfect and it shouldn't have been banned in the first place. A very simple discussion for a very smart and simple card. How I love and hate this card. It is basically a supped up version of sakuretsu armor and can generate massive field control. Against skilled players this card tends to be a one for one; yet there is always the potential 1 for 5.
it is a feared card by the standards of any swarm oriented deck. It deserves a 4.9/5 because it is not chain-able. This card unlike dark hole does not guarantee monster removal upon its use, but it is still a great draw against anything outside of Jinzo and Royal Decree. "do to the absents of Breaker, I'd say he is on a break:P"
-and laugh at the fact you have eaten/spit all over one of the most broken cards ever made. Stats : Mirror Force is a Normal Trap, though only non-players and the newest of newbies wouldn’t know this. This is a disadvantage, but due not to Traps being bad but rather cards like Jinzo and Royal Decree that are easy to slip into most any deck to easily negate all Traps, and the easy to use Spell/Trap removal (including mass removal like Heavy Storm). Effect(s) : Also hurting Mirror Force is that it’s got a specific “trigger”: it can only be activated in response to an opponent’s attack. Of course, this is a pretty common trigger and only matters because of the excessive easy S/T removal. The effect is that it negates the attack, and then destroys all face-up, ATK position Monsters your opponent has on their side of the field. Okay, in raw card count, that means up to a 5 for 1: one card expended to destroy up to five of the opponent’s. Then there are the less tangible advantages: their Monster going to destroy one of yours you didn’t want dead? Well, a potential -1 was eliminated, doesn’t that matter? Unless they can Special Summon in the Battle Phase, you basically forced them to miss their Battle Phase. If they already did their Normal Summon, good chance that now they won’t have a Monster to defend them next turn. A very potent effect indeed. Combinations : This is basically a Staple. Yes, many games it’s going to be nuked by S/T removal, but most of us only play the best Traps in the game right now: so if Breaker “breaks” this, he can’t use his effect to nuke your Torrential Tribute or Call of the Haunted, etc. More importantly, with the last Ban List, we learned how good Sakuretsu Armor (and to a lesser extent, Widespread Ruin) were. Mirror Force is Sakuretsu Armor on steroids. People were running the slightly weaker Widespread Ruin as a “fourth” Sakuretsu Armor, so now they have something better to run than that. Besides, just being legal, Mirror Force alters the game. Most decent players know the danger of “overextension”: if it’s not ending the game, it is very risky to play out one’s entire hand, (or even most of it if it’s very early in the game). However, this is a game where players should have a field with several Monsters: attacking to deplete Life Points is a large part of the game. Mirror Force creates an easy way to lucksack back from a near loss. Not skill, luck: as long as they can’t destroy the S/T, you just blow up their guys. Even if the opponent suspects it and shifts extra attackers to DEF mode, and you only destroy one or two Monsters, and they still win, it slowed them down not with skill, but with an overpowered card you were lucky to draw into. There is a little skill, since this is a Trap that can’t be chained at the drop of a hat, but knowing how to do that is one of the basic skills needed to be considered not bad. So Mirror Force only speeds the game up when it ruins someone else’s skill (of getting Monsters into play, or even worse, the “justified comeback” where after you play your cards right to get a good attacker into play… it crashes into Mirror Force). Now, some will say Mirror Force is needed to keep swarm decks in line: I disagree. You run Lightning Vortex and maybe Pineapple Blast in your side deck, and if the swarm deck is really good, maybe a good defensive Trap like Waboku. They swarm, you blow it up. They swarm, you blow it up again, and chances are now they can’t afford to swarm again. That’s the inherent weakness of swarm-tactic decks. There’s also the fact that many decks that can swarm well… also use a Monster type that a “Type kill Spell” exists against: for example, you run into a good Gravekeeper deck a lot? Side in Last Day of Witch. Most swarm style decks I’ve seen are pretty balanced anyway: Gravekeeper’s rely on a Field Spell and also have low ATK scores, Harpies rely on a Spell card to get just one of their number out, and while they can have a better attack score than many Gravekeeper’s, they can’t re-swarm as easily. 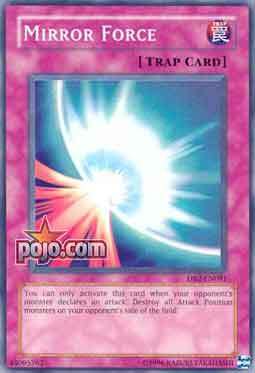 In other words, run this unless you want no Traps in your deck, and why was Konami so stupid as to bring this back? Traditional : 4/5 – Great card, and one of the reasons Monsters die so readily in this format. Yes, it’s going to have a hard time going off, but when it does, it’s probably setting you up for the win. Advanced : 4/5 – Same score because while it is more useful here, I’ve been told to cut back on fractions. Here it has a much better chance of going off, though you’ll have to work just a hair harder to get the win the turn after. Now, over the next three turns after it goes off, that’s pretty doable. Limited : 5/5 – It will all but actually score the win. Mirror Force is one of those cards you run if you have a copy and even though I have a copy (and have since before Spell [Magic] Ruler was released) I am very annoyed that it was re-released. My scores may seem low, but that’s because it’s based on power/usefulness, and there are more potent cards in this game, sad to say, though it’s probably the most potent of the Defense to Offense cards. What’s more sad is some will think this card is all about skill when compared to, say Dark Hole. This card may take more skill to use than Raigeki, but Mirror Force as used in competitive play is all about not drawing into it until you’ve forced your opponent to play out their S/T removal, or praying they don’t have any to use when you do set it. Your opponent can demonstrate some skill in response to it, but it’s like talking skill about using buck shot or slugs in your shotgun… for a fencing match. I don’t care if the judging committee is insane enough to allow it, or if your opponent is packing a pistol, none of it belongs.